An old term used to describe cuts of meat that are thinly sliced or lightly pounded into flattened pieces that are then grilled or sautéed very quickly. 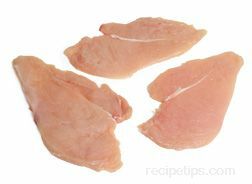 Today the term more commonly used to describe this thin cut is cutlet. Paillards are made from boneless slices of chicken, turkey, veal, beef, and pork. The thin slices are generally cut from larger pieces of meat but supermarkets now have a variety of thinly sliced meats that can be used for paillards, eliminating the need to cut the thin slice before pounding.